This musical spoof of Westerns featured Lee Marvin in dual roles that won him a Best Actor Oscar. Jane Fonda stars as the title character, a prim schoolmarm returning to her hometown of Wolf City, Wyoming, after receiving an Eastern education. On the train ride, Cat meets up with a pair of friendly, charming crooks, Clay Boone (Michael Callan) and his uncle, Jed (Dwayne Hickman), the former becoming hopelessly smitten with the naive but tough Cat. Upon arriving home, Cat discovers that her eccentric father, Frankie (John Marley), is being threatened with bodily harm by a development company that desperately wants his land. When Frankie is murdered by ruthless, noseless killer Tim Strawn (Marvin), Cat straps on a pair of six-shooters and persuades Clay, Jed, and her father's loyal Native American hand Jackson Two-Bears (Tom Nardini) to sign on as her posse. In her quest for revenge, Cat also recruits Kid Shelleen (also played by Marvin), a one-time fearsome gunslinger who's now a hopeless alcoholic. 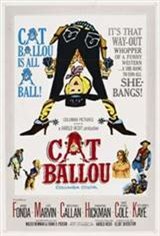 Cat Ballou (1965) is interspersed throughout the narrative with appearances by Stubby Kaye and Nat King Cole as a pair of balladeers who comment on the action musically in Greek chorus style. "Can you tell me what theatre chain originally screened Cat Ballou in Ontario, Canada (eg. Famous Players/Odeon)? thanks!"